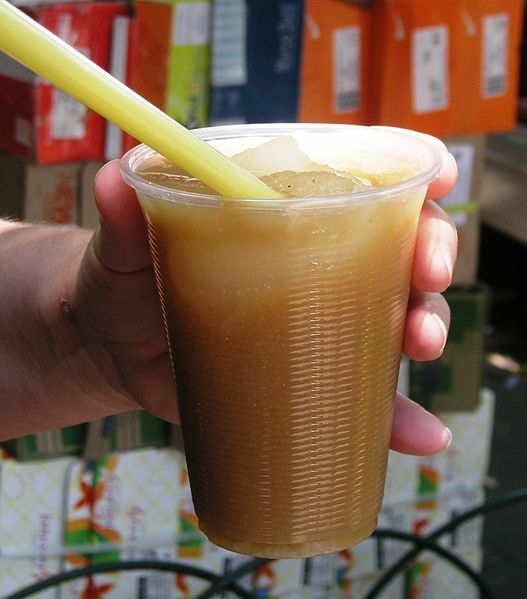 Tejuino is a cold beverage made from fermented corn popularly-drunk in the Mexican state of Jalisco. It is often served with a scoop of shaved ice. Tejuino is made from the same corn dough used for tortillas and tamales. The dough is mixed with water and brown sugar (piloncillo) and boiled. Then the liquid is allowed to ferment very slightly. Left: A cup of tejuino with shaved ice in it. The resulting drink is generally served with lime juice, a pinch of salt and a scoop of shaved ice or lemon sherbet. It is usually sold by street vendors in small plastic cups or in plastic bags tied around a straw.